Sanju learns something about her Grandma that changes her attitude. Sanju was unhappy. 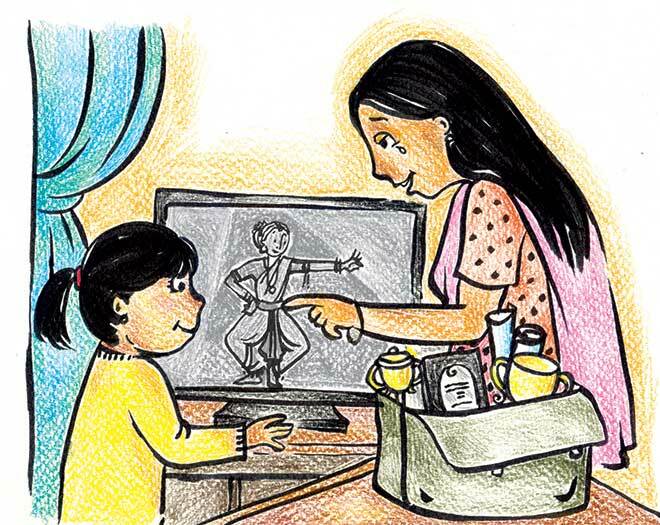 Her grandmother had come to stay with her family, and Sanju had to give up her study room for her grandmother to use. Sanju was upset because it was not just her study room, it was where she spent most of her time listening to music, playing, dancing or relaxing with a book. A lot of her precious stuff was in that room. Now, what was she going to do? Why had Uncle Rajesh left Granny with them? Granny lived with Uncle Rajesh in their ancestral home. Sanju had met Granny only a few times as her parents hardly found time to pay them a visit. To Sanju, Granny was an old person, who was ill and confined to a wheelchair. “What would she know about the current generation?” thought Sanju. Whenever Granny tried to talk to her, Sanju would promptly make her escape. As days passed, Granny kept to herself in the room and spent most of the day listening to music in her old tape recorder. 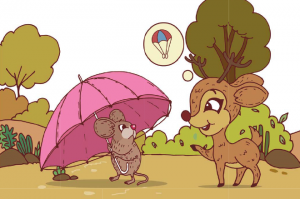 Sanju did not make any effort to talk to her, despite her parents’ insistence, and went to her room only if she wanted to get any of her things. 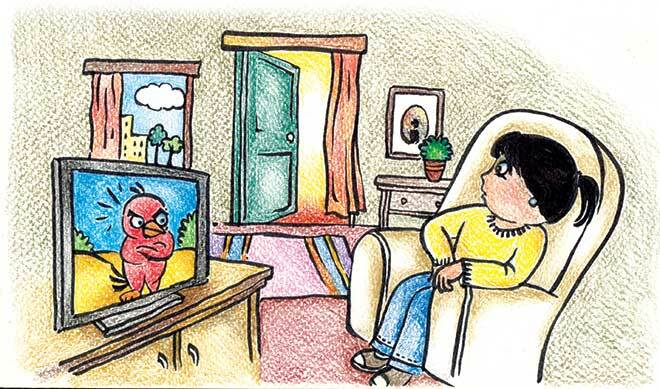 One day, Sanju was watching her favourite cartoon show, when the music from Granny’s room distracted her. It was a classical song that she was familiar with, as her dance teacher had just taught her a routine set to that song. The song was being played again and again. 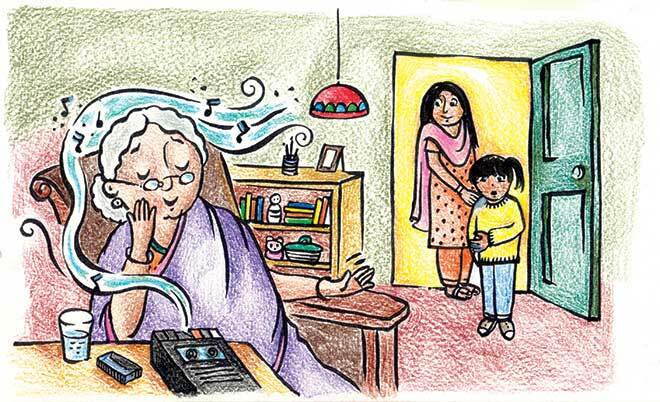 “Ma, why is Granny playing that song again and again?” Sanju whined to her mother. Ma shut her laptop and went to Granny’s room along with Sanju. She knocked but there was no answer. Ma slowly opened the door. Inside, Granny was sitting in the armchair with her eyes closed. She was smiling and her eyelids flickered as if she was dreaming. Her fingers tapped on the armrest rhythmically. “What is she doing, Ma?” asked Sanju. “She is dancing,” said Ma, smiling at Sanju. “Come with me. Let me show you something,” said Ma. Ma closed the door behind her and led Sanju to her room. She took out a bag from the cupboard and handed it over to Sanju. “Take a look,” said Ma. Inside the bag, there were several trophies and certificates from various dance competitions. All of them had Granny’s name on them! “Granny was a dancer?” asked Sanju disbelievingly. “Yes, she was a great dancer! But she stopped dancing after we were born. I found this among her belongings,” said Ma. Sanju rummaged through the bag. At the bottom, she found an old video cassette. “What’s in it?” asked Sanju curiously. “Let us find out,” said Ma. Ma brought down their old video player from the attic. She dusted it thoroughly, connected it, and played the cassette. It was a video of Granny dancing. “I can’t believe Granny was so young and beautiful once! And look how well she dances!” exclaimed Sanju. “Actually, she looks somewhat like you in her dance costume!” said Ma. Sanju smiled. She was proud of her Granny. 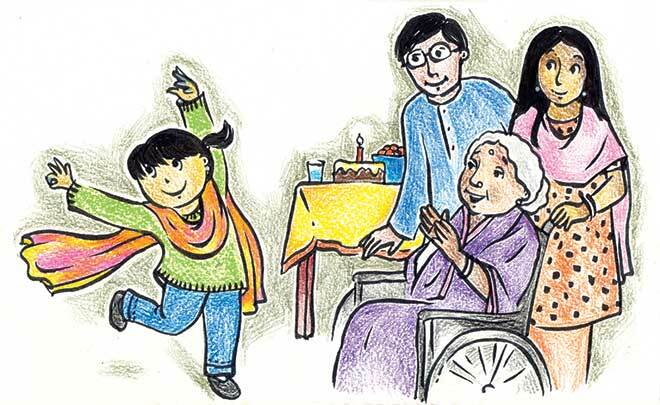 “So, poor Granny imagines herself to be dancing every day,” said Sanju thinking loudly. “Yes, that seems to make her happy,” said Ma. Suddenly, Sanju brightened up. “Ma, I have an idea! How about we surprise Granny tomorrow?” she asked. “How do you plan to do that?” asked Ma. Sanju whispered her plan into Ma’s ears and the two chuckled. The next morning, Ma wheeled in Granny to the living room which was beautifully decorated. Pa and Sanju were standing near the table, on which Granny noticed a cake. “What is going on? What is this cake for?” asked Granny puzzled. “It’s for you Granny! To the best dancer I know!” said Sanju, hugging her. “But before you cut the cake, here is a special performance by Sanju,” announced Ma. Granny’s favourite song started playing, and Sanju danced to it. Granny was overwhelmed with emotion. She laughed and cried, and applauded loudly when Sanju finished the dance. Granny pulled Sanju into a tight hug and kissed her forehead. “I love you, Granny,” said Sanju. “I love you too, my child. This is the best gift ever,” said Granny, wiping away tears of joy.